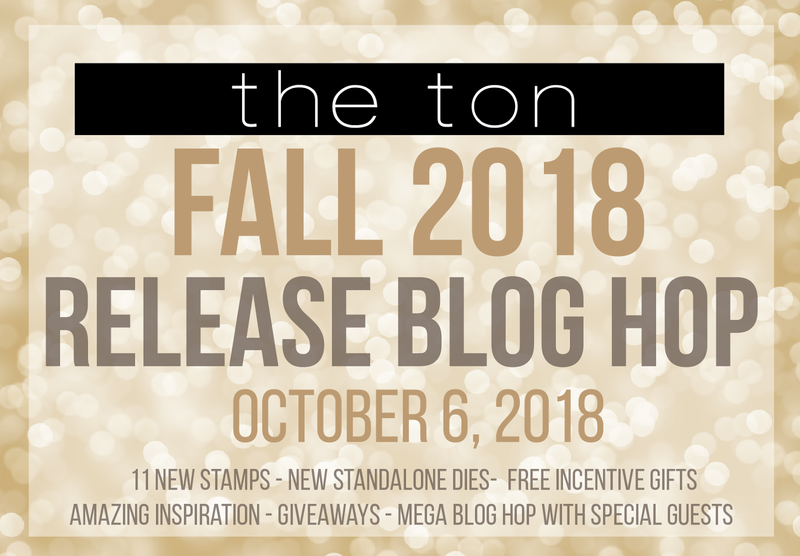 Welcome to The Ton’s Fall 2018 Release blog hop! For this release, The Ton has debuted 11 new stamps and a new pop up floral die. There are free gifts with purchase promotions also! There’s also a little surprise for today since it is World Cardmaking Day. Head over to The Ton’s blog for more details. 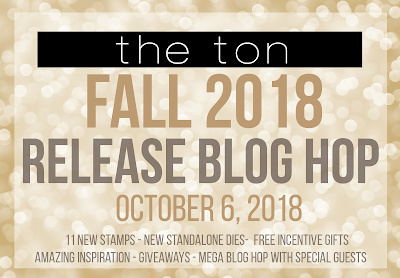 For today’s hop, there are giveaways on each stop so be sure to leave a comment on each blog for a chance to win a stamp set of choice from our new release! The comment period for this giveaway will close on Monday, October 8 at 11:59pm EST. I had so much fun with this release. So here are few cards I made. First let's start with the Wonderland print set. I am in LOVE with this set. I used different colors to stamp the images so I can get different results. Tip: the colored kraft stamp is stamped first in white prigment ink, then let it dry or heat set and stamp over it the images in color. Next, is another set of cards that I pretty easy to make and they are perfect for the holidays, it's a set called Blizzard Hugs. I stamped the images onto shimmery card stock then embossed and aded sentiment. 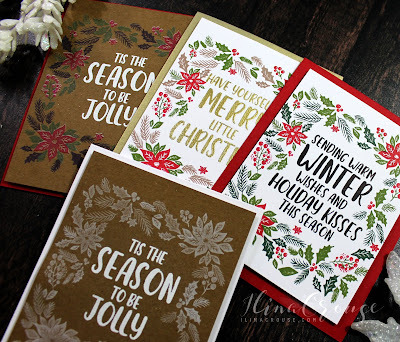 GIVEAWAY: there are giveaways on each stop so be sure to leave a comment on each blog for a chance to win a stamp set of choice from our new release! The comment period for this giveaway will close on Monday, October 8 at 11:59pm EST. In true form you've outdone yourself...these are fabulous! I love all the simple designs of your cards. This way, you can make a ton to give away!! Great design! Love the clean designs in these cards. Especially love the snow flake ones! I am in love with that Blizzard Hugs stamp set... and I see that I just might need the tag set for cards as well as tags! I love your multicolored sets of cards... so many fun ideas! Beautiful cards....every single one....nice representation of this release. Thank you so much for sharing these. Love these! Simple yet elegant! These are just stunning!! Thank you so much for the great inspiration, can't wait to get in my craft room now! My favorite has to be the last. I LOVE THEM ALL! Great sentiments and I love the different versions of each you made! great designs! really like the first set! 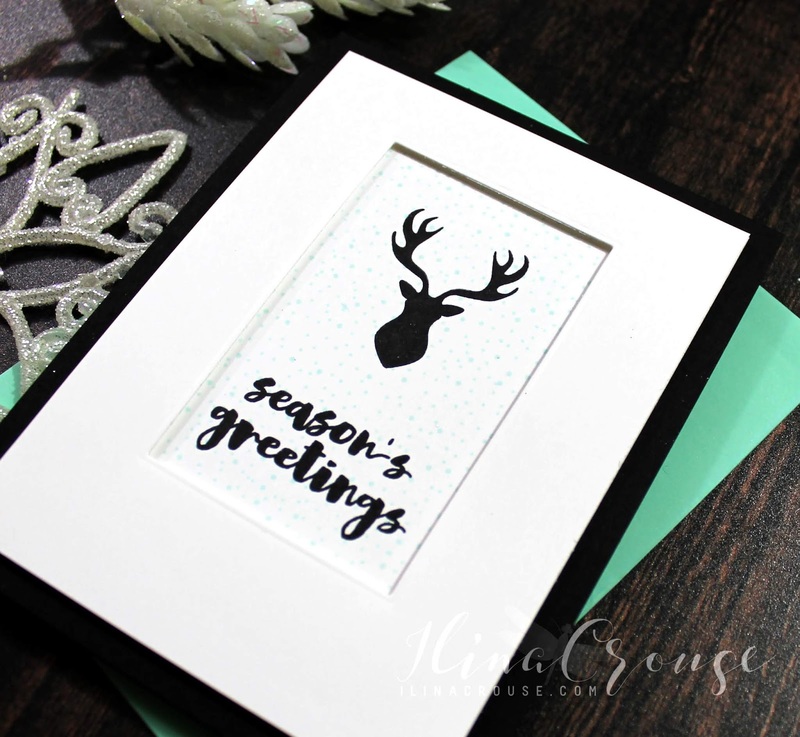 The reindeer card really catches my eye - it's simple and elegant. These are all stunning cards Ilina, I especially like your first one using the Wonderland Print with the white ink first then colour over it on the kraft, very showy. A fabulous release. Great fall release, Awesome creations! 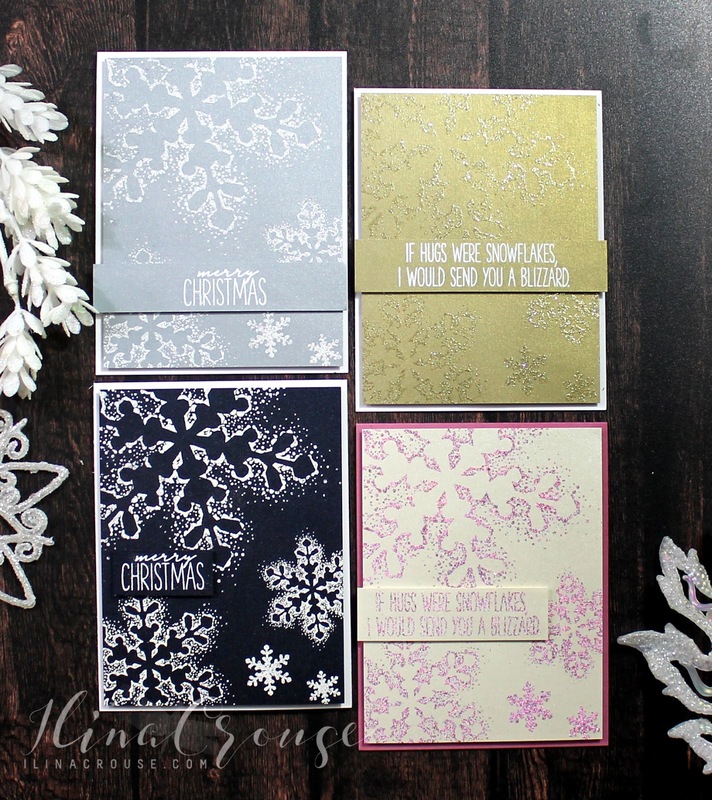 I especially love the snow flake cards! I love making multiples of the same design! Beautiful cards, thanks for sharing. Such beautiful cards! I love all the different colour combos you used! So many beautiful cards! You were definitely busy! I just love all the different styles for each set! I really like the wonderland prints cards. Thanks for sharing. Your cards are Amazing! I love how you can make so many at one time. I love the different style cards. All your cards are fantastic! Thanks for sharing. stag for a masculine card. Can't go wrong with it. The snowflake set is awesome! Interesting technique to heat emboss in white then stamp over in another color ink. I'm going to have to try that. Any specific brand or type of inks for the color layer? I love all of the cards but the Blizzards Hugs is my favorite. Reminds me of chilly cold nights!! These are fabulous! Classy designs and really charming! 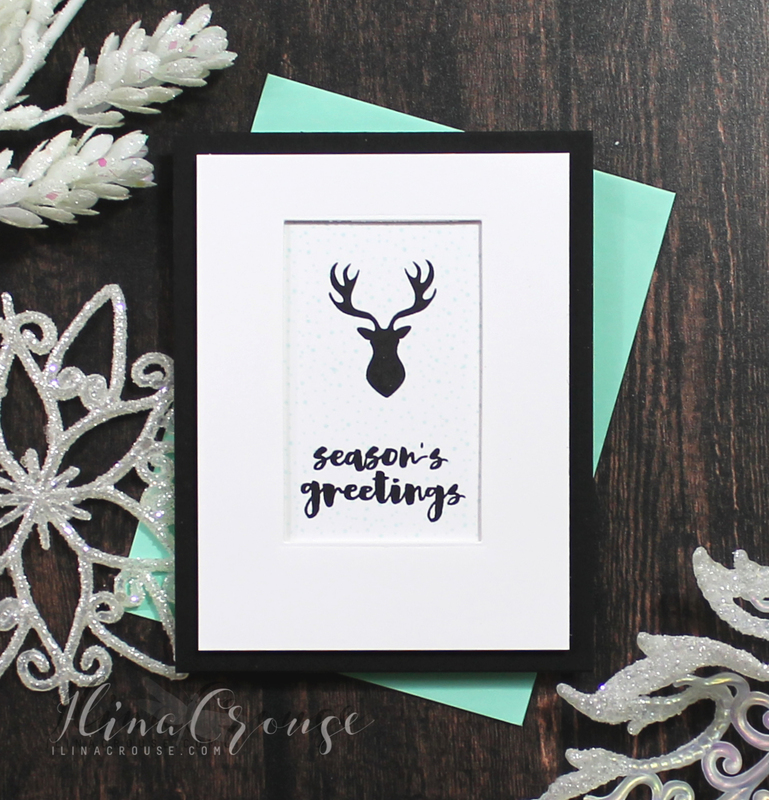 Your snowflake cards are glorious! I need that set! Love the beautiful colors on the snowflakes! 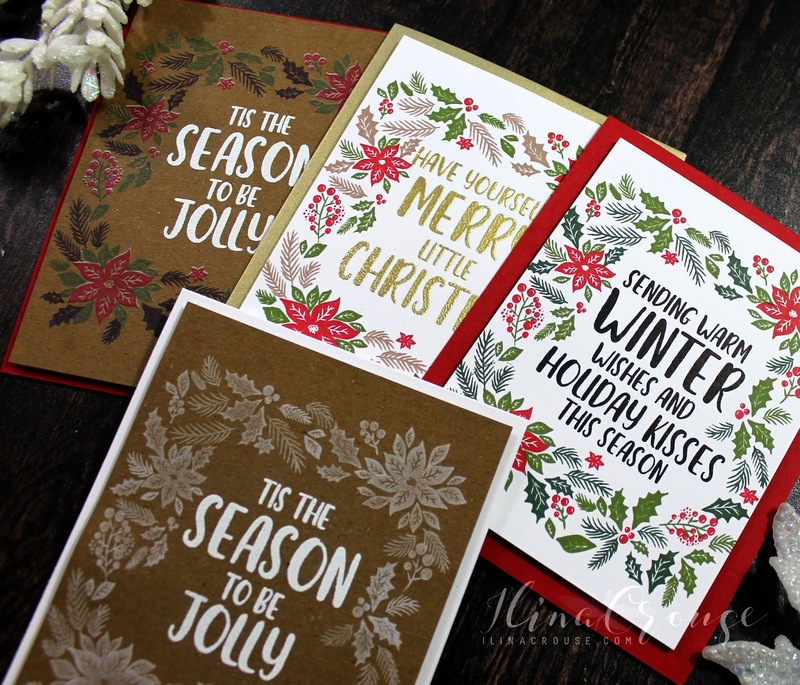 Pretty sets of cards for the holidays. The clean and simple look of your cards is amazing, and yet they are very classy! Thanks for sharing the masculine card using Chic Tags set. I appreciate the inspiration as that stamp is a little challenging! 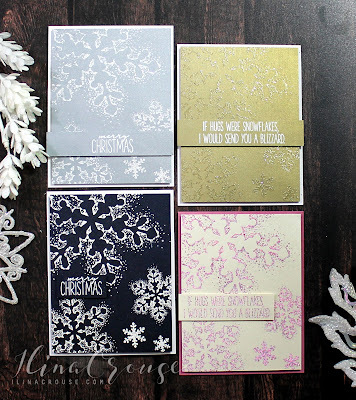 Lovely designs and sentiments on these beautiful cards! 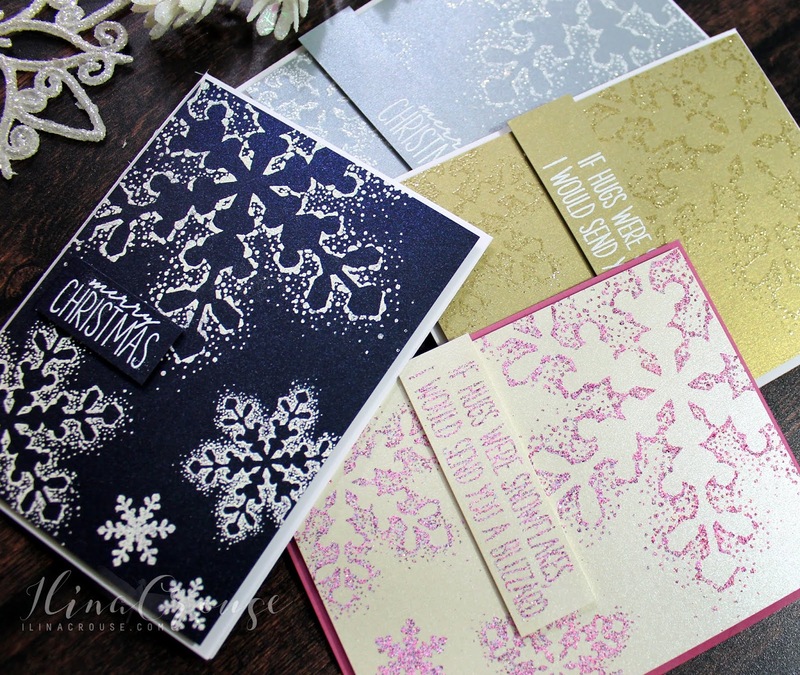 The snowflakes on navy paper look fabulous! 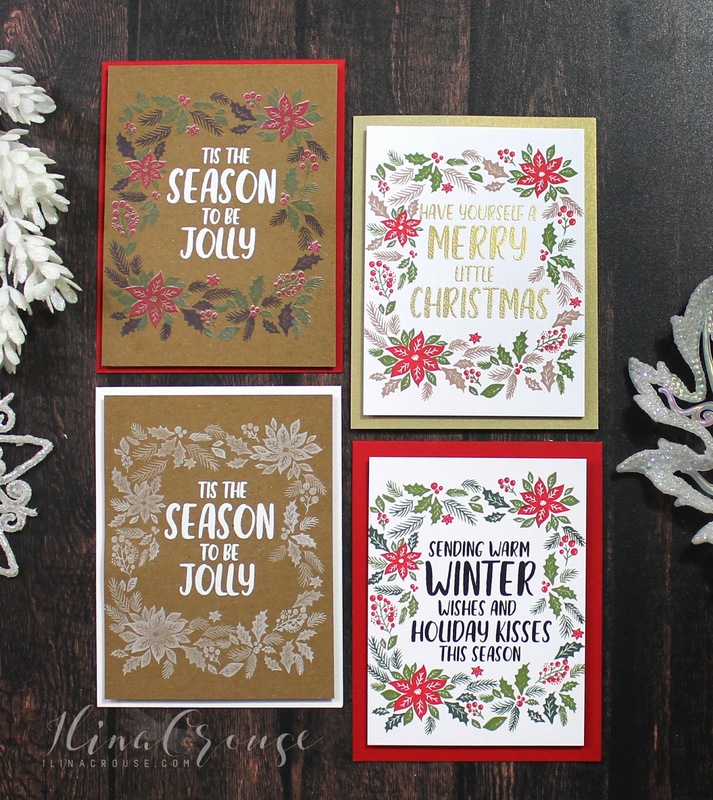 Gorgeous card designs! Beautiful and creative - stunning! 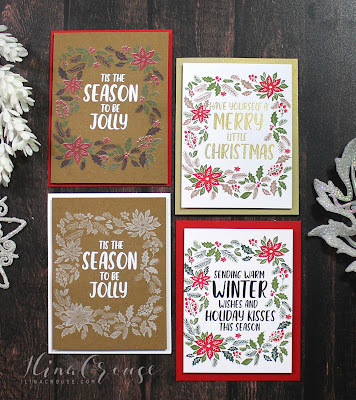 What fun Christmas card sets you have created! Wowza, fantastic sets of cards! The first one is simply gorgeous, and for sure my favourite! Your cards are so happy and festive. Thanks for the inspiration.